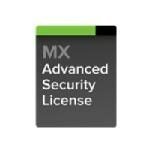 The Meraki MX Advanced Security Support and License brings the benefits of cloud based centralized management to the powerful Meraki MX security appliance platform. In addition to unlimited client VPN access, content filtering, anti-virus/phishing engine, feature upgrades and 8x5 live enterprise support, Meraki’s Dashboard cloud provides real-time connectivity, VPN tunnel and WAN optimization monitoring, end-client discovery and fingerprinting, and alerting tools to notify administrators of downtime and configuration changes. Each Meraki MX device is automatically provisioned from the cloud, radically simplifying large-scale distributed deployments. Rich web-based diagnostics let you troubleshoot, manage and secure your networks from any web browser.